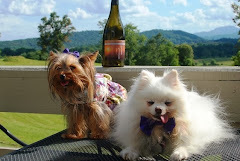 The Wine Dogs continued their exploration of Shenadoah Valley wineries with a trip to Cave Ridge Vineyard. Cave Ridge is an estate winery, meaning they grow all the grapes used in their wines right there. Owner and winemaker Randy Phillips planted the grapes in 2000, and opened the winery in 2006. Cave Ridge produces about 2,000 cases a year, and wants to stay small and focused. Randy's wines are dry in style, and all straight varietals (one kind of grape), except the Rambling Rose' (a blend of Traminette, Chamourcin, and Cab Franc). 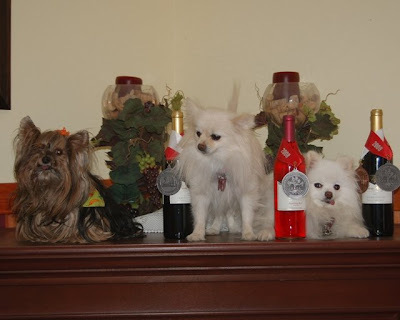 Randy's wife, Karen, welcomed the Wine Dogs with open arms. 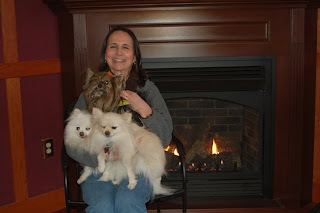 Munchkin, Pomeroy, and Izzy made themselves at home in the comfortable tasting room. The low ceilings provided a cozy, cave-like feel, while the paneling and fireplace offered welcome warmth on a still chilly February afternoon. The winery is nestled between the Alleghenies and the Blue Ridge Mountains, and the big glass windows offer an excellent view. Munchkin went of to explore the kitchen, where resident wine dog Boomer, a Black Lab hangs out. 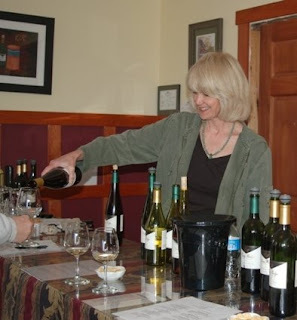 Marcie served as hostess, toasting the Wine Dogs' visit with Cave Ridge's Sparkling Traminette for starters. The bubbly was great on its own, and we're told it makes a great Mimosa for Sunday brunch (hint: use passion fruit juice instead of orange juice). Izzy likes the regular 2005 Traminette, which had a cinnamin finish that reminded her of apple butter. 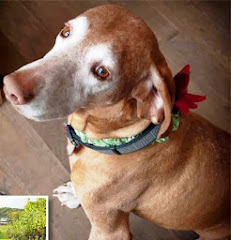 The regular tasting features 10 wines, some with food pairings including a coffee-infused key lime chocolate with the Rose (none for the pups). There were two semi-vertical pairings (different vintages of the same wine for comparison). The first was the Viogner, actually two separate bottlings of the same vintage, but with fermentation stopped two days earlier on the first, leaving 2% residual sugar. 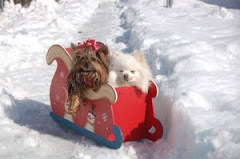 Roy and Izzy approved, giving it two Poms up. Munchkin held out for the reds, which featured both an 05 and 06 Chambourcin. The o5 was the paws down favorite, with an intense flavor and juicy mouth feel. All the reserve wines were standouts. We started with the 05 Viognier, Marcie's favorite among Cave Ridge's whites; the 05 Cab Franc has won lots of medals with a good nose and lots of legs; Munchkin was very enthusiastic about the fruit-forward 05 Petit Verdot (Karen's favorite) and thought she'd found her wine... until she tasted the 05 Syrah, recently judged best wine in its category in the Eastern United States. But the best was yet to come. 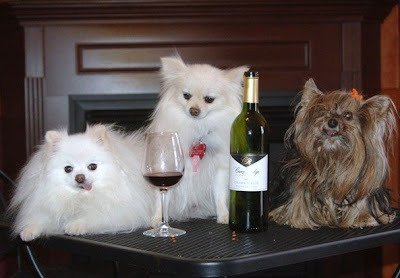 The Wine Dogs got to experience the release of the 06 Red Silk Barrel Select Cabernet Franc. The smooth (and yes, silky) sultry red had Munchkin begging for more, but just as she said "yes, yes, yes" tail wagging hard, the word came down "You can't buy it." This wine was only availble to Fossil Hill Wine Club members. 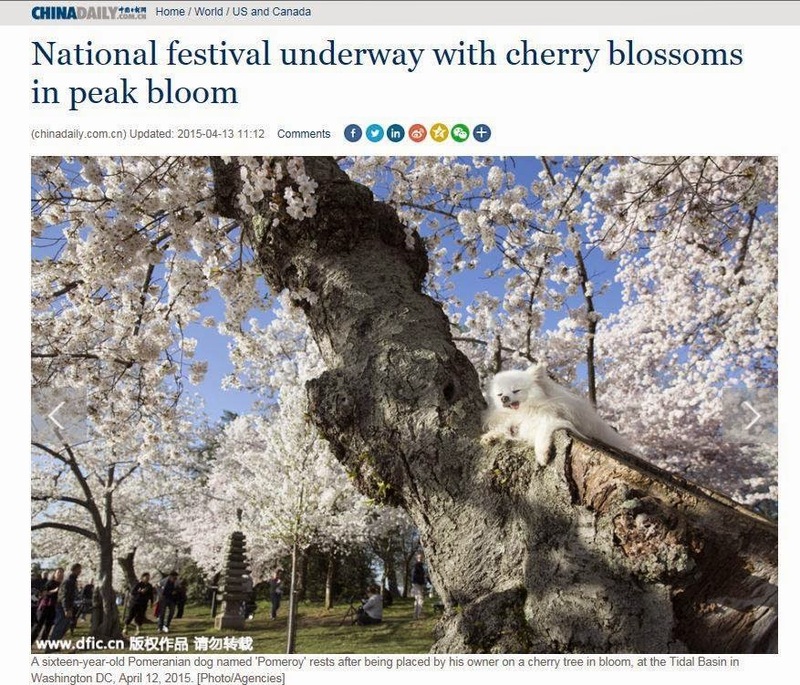 The Wine Dogs will be back. Thanks for mentioning your visit to Cave Ridge. Sorry I missed meeting you and the canine oenophiles. Hope to have you visit again soon. and it's going to the Dogs. 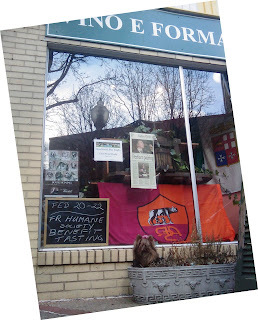 Over President's Day weekend, Munchkin and Pomeroy took a trip into town (Front Royal) and discovered a wonderful new wine shop on Main Street -- Vino e Formaggio. 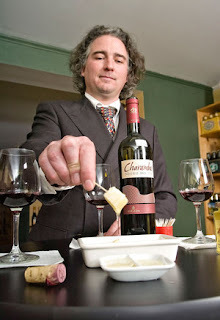 Top dog at the store is Christian Failmezger, a wine enthusiast who is eager to spread the love of the grape. The shop features wines in the $10-$20 range to encourage new winedrinkers to experiment and find the wines that set their tails a waggin'. 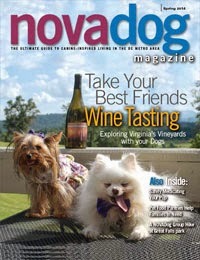 The Virginia Wine Dogs were pleased to find a strong selection of Virginia wines (for those times when visiting the winery just isn't practical). 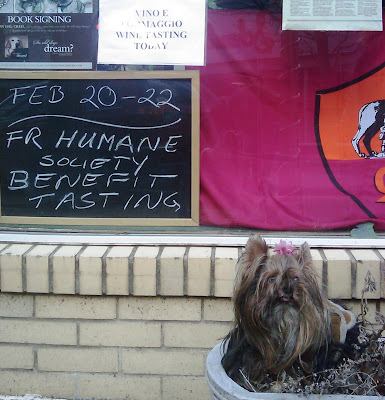 Vino e Formaggio offers weekend wine tastings (beer on Sundays) as part of their education campaign. They are "always fun and always free." Munchkin was back the next weekend (February 20-22) for the special Vino e Formaggio Dog Benefit for the Warren County Humane Society, the Service Dogs of Virginia, the Saint Francis of Assisi Service Dog Foundation (dedicated to raising and training service dogs for assisting individuals with disabilities), and the San Francisco SPCA. 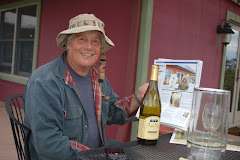 There was a special selection of dog-oriented wines, and on Saturday, local author, Hal Creel, was on hand to sign his book, Do Old Dogs Dream? Munchkin is not going to reveal her age, but listening to her contented sighs as she sleeps will give you a clue. The book is a beautiful collection of photographs and poetry in loving tribute to Chester and other dogs of a certain age. 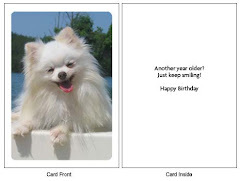 And the author is donating all profits from the sale of this book to the rescue and care of old dogs. 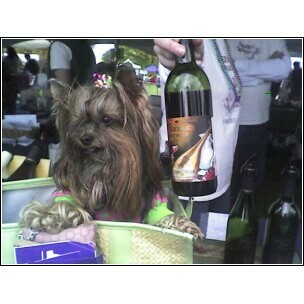 For Munchkin, the top dog among the wines was the Liberty, a red blend from Château Morrisette here in Virginia. 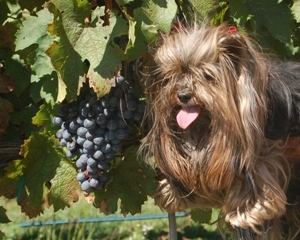 Check out the winery's website at www.thedogs.com (gotta love it). 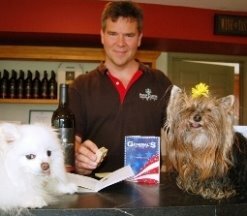 Chateau Morrissette donates a portion of the proceeds from Liberty and its sister white, Independence to Service Dogs of Virginia and the Saint Francis of Assisi Service Dog Foundation. Dan, Virginia. If you can't get out to Floyd, you can pick up a bottle at Vino et Formaggio.